Although it is true that divorce involves a lot of paperwork – and most of it requires signatures –, the lack of a signature will not stop a divorce from happening -- although it may prevent you from filing in the first place. If you do not sign the petition for dissolution, you can be prevented from initiating the divorce; but if you fail to sign other documents, it is more likely to complicate the proceedings. You cannot initiate divorce proceedings in Georgia without signing your petition. The court will not accept an unsigned petition, so you must sign it before filing or you remain married. If your spouse filed the petition, you may want to submit a written answer to the court. This response also must be signed. However, Georgia law is unique in that you do not absolutely have to file an answer and risk that your spouse will get the divorce by default. In states that allow default divorces, typically, the filing spouse receives everything she requested in the unanswered petition. However, this is not the case in Georgia, because the state does not recognize default divorces. If you do not file a signed answer, however, you may end up at trial without having clearly stated to the court your positions regarding issues such as property, custody and support. Your spouse can schedule a final contested court hearing with or without your cooperation. Service of process involves someone giving you due notice of the divorce in such a way that the event can be recorded with the court. The process will proceed more smoothly with your signature, but if you refuse, this will not stop the divorce. If your spouse filed the petition to open the divorce proceedings, Georgia gives you the option of signing an acknowledgment of receipt of the paperwork. If you are willing to do this, your spouse can either mail the paperwork to you or hand-deliver it. If you are not willing to sign a receipt, a county sheriff or a private process server can hand you a copy of the petition. If you manage to evade the process server or the sheriff so they cannot find you to serve you, Georgia law allows your spouse to serve you by publication in a newspaper. If you and your spouse reach a marital settlement agreement that resolves all issues of your marriage, you can write the terms in a formal document and submit it to the court for approval. If the court accepts it – and it usually does if the terms are reasonable – you will be divorced, although a few additional intermediary steps might be necessary, such as attendance at a parenting seminar and completing child support worksheets if you have children, and completing a separate parenting plan addressing issues of custody and visitation. This is an uncontested divorce in Georgia, and the settlement agreement requires your signature. Without it, you will be involved in a contested divorce proceeding. Your marriage will legally be over, but the court will decide the terms of the divorce, which may not be the terms you want or the terms you can live with. If you do not file a signed response to your spouse's divorce petition, she can still request a contested hearing from the court – the equivalent of a divorce trial -- because Georgia does not recognize the concept of divorce by default. The same applies if you refuse to sign a settlement agreement. 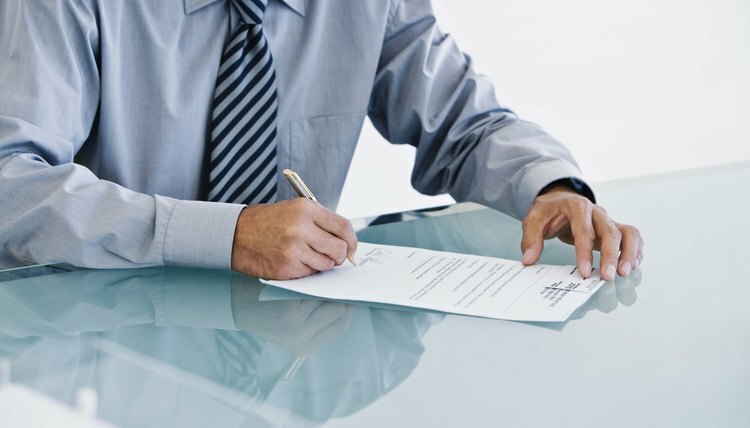 If you have doubts about any documents you are asked to sign, take them to an attorney for review. Refusing to sign a document may cause you more headaches than doing so. No matter his reason, your spouse cannot legally force you to stay married in New Mexico. Some spouses will not sign an acceptance of service, thinking such inaction will stop the divorce proceedings. The path your divorce will take when your spouse will not sign an acceptance of service and agree to the terms outlined in the petition can either proceed as a contested divorce or result in a default divorce.